German States Stamps is the universally accepted category for the postage stamps of Helgoland, issued between 1867 and 1890. Helgoland is the German language name for the 19th Century British Possession of Heligoland. For more information on why this is acknowledged as being true, see the Helgoland - A Brief History article. Truthfully, the only thing about the stamps shown above that is "British" is the profile of Queen Victoria. In all other respects, the stamps, as well as the postal system of this tiny island state, were "German". The postage stamps were issued under a rather complex agreement between the British and the Germans. The postal system was administered by Hamburg, and the stamps were denominated, until 1875, in Hamburg currency. After 1875, they were dual denominated in Imperial German currency and in British currency. The stamps were designed by Heinrich Gätke, a German ornithologist and artist that lived there from 1841 until his death in 1897. Finally, all of the postage stamp issues were printed at the Prussian State Printing Office, later the Imperial Printing Office, in Berlin. Be Cautious, but Don't Be Afraid! With the reputation of being very complex, and with the overwhelming number of private reprints on the market, this can be a very daunting prospect for many collectors and specialists of German States Stamps. With the assistance of an American Philatelic Expertization Service expert that specializes in the stamps of Helgoland, I have just recently started working on this area myself. Discounting color / shade varieties, the Michel catalog lists 20 major issues. This means there are only 20 philatelic "problems" that have to be evaluated and resolved in order to collect the stamps of this state. By having the basic tools required and by following the established guidelines for attributing each of the major issues, it is absolutely possible to "safely" collect all the stamp issues of Helgoland. The basic tools required are a good eye for color, the ability to determine different paper types, a perforation gauge that is capable of measuring in quarters, and an ultraviolet lamp. The Michel Deutschland Spezial-Katalog volume I is a MUST HAVE reference for the specialist. The descriptions in the Scott and Gibbons catalogs can be confusing, misleading, and in some cases they are COMPLETELY WRONG. A summary of these factors follows. The technical aspects of each of the German States stamps of Helgoland will be presented in the individual web pages on the separate issues. For those wishing to review the detailed guidelines on these issues, links to them will be provided at the end of this overview. Type 1 - has a solid round knot of hair hanging from Queen Victoria's chignon. The base of the neckline is rather pointed and symmetrical. Type 2 - has a hanging curl open towards the neck and is shaped rather like a sickle or the tip of a corkscrew. The neckline is rounded slightly upward and the underside of the neckline is concave. Type 3 - has a short curl pointing to the neck and it may be compared to a spigot or a tongue. The neckline comes to a sharp point and is convex on the underside. Type 1 - Only occurs on Michel # 1 I, 2-4, and 8-10. Type 2 - Only occurs on Michel # 1 II, 6, and 11-16. Type 3 - Only occurs on Michel # 7. Any stamp that deviates from these three groups, as far as the head type, is either a reprint or a forgery. ALL of the original postage stamps of the 1867-1868 issue, Michel # 1-4, are Rouletted 10 x 10. Any other rouletting measurements indicate either a reprint or a forgery. ALL examples of Michel # 1-4 that are perforated are reprints. On the original printings of the rouletted stamps, the rouletting often appears a bit ragged and the corners are usually rounded. This often happened during the separation of the rouletted stamps, and it does not affect their value. Stamps that have very distinct rouletting and squared corners are probably private reprints. The the original perforated German States stamps of Helgoland, Michel #6-7, are Perforated 13-1/4 x 14-1/4, and Michel #8-20, are Perforated 13-1/2 x 14-1/4. Of course, there are private reprints that match these gauges, principally the Leipzig reprints, but then, this is only one of the factors in determining that a stamp may be a private reprint. Any stamps that do not match gauges noted above are absolutely reprints or forgeries. Stamps that are Perforated 14 x 14 are Hamburg reprints. The 1867-1868 issue was printed on normal paper. The sheets were rouletted from the face side. During the rouletting process, the sheets of stamps were laid upon a negative grid of grooved metal. This negative grid always made a pronounced indentation in the extreme outer margins of each of the stamps on the sheet. This is what we call the "Ridge" in Helgoland philatelic terminology. These ridges are sometimes difficult to see, but traces usually appear in at least one of the margins of the stamp. Stamps that do not show any trace of this "ridge" may quite possibly be reprints. I have noticed that, viewed from the front of the stamp, these usually appear as colorless or very light grayish lines, in one or more of the extreme margins that are parallel to the adjacent frame lines of the stamp. I made three close-ups of my authenticated 1867 issues, and they are shown above. Top Left: The ridge lines show faintly, parallel to the left frame line and the bottom frame line. Top Right: The ridge line is stronger, and it is parallel to the left frame line. Bottom: The ridge line shows at the bottom corner and along the bottom frame line. Another means of detecting the ridges requires the physical examination of the stamp. Along with strong side-lighting (whether a desk lamp or maybe a pen light), position the stamp upright so it can be viewed from the edge. With the aid of good eyesight or a magnifying glass, the upward projecting ridges, or traces of them, should be visible along one or more of the far margins of the stamp. I attempted to create a photographic representation of this edge examination process, but it didn't work out very well. With a little practice, using original examples of the rouletted stamps, it will become obvious to most collectors of these issues. Of course, on a "perfectly centered" example, there could be a situation where none of the actual outer edge ridge lines are visible. In this event, one will have to use the stamp's other attributes to determine whether it is an original or a private reprint. The first perforated German States stamps of Helgoland, Michel 6x and 7x, issued in 1869, were printed on thick soft paper. Beginning in 1873, a thick, slightly rough, slightly yellowish, quadrilled / cross-hatched paper was used for the printing of stamps. They were Michel #6y, 7y, and 8-10. The quadrilling / cross-hatching is very fine and is parallel to the edges of the stamps. NONE OF THE PRIVATE REPRINTS WERE EVER PRODUCED, UTILIZING THIS TYPE OF PAPER. An un-issued variety of the 1873 1/4 Schilling, Michel #8c, was printed on a thin, wove paper. The Leipzig reprints of these issues are printed on a white, glossy paper. It is guaranteed that everyone that specializes in the German States stamps of Helgoland is going to find that problem stamp that doesn't exactly fit into all the criterion for either being an original or a private reprint. In almost all instances, this comes down to being able to determine the differences in color between all the known originals and all the known reprints. Multiple people may interpret the same color in many different ways. This is one of the PROBLEM areas for nearly all serious philatelic specializations. In the ensuing web pages on the individual issues, the Michel listed colors / shades of each of the original stamps will be given, along with those for each of the privately reprinted stamps. In many cases, this will be the deciding factor in determining the authenticity of a particular stamp. One almost needs an existing reference collection for absolute comparison of colors and shade varieties. I would suggest this for the beginner just starting out specializing in the German States stamps of Helgoland. First of all, when buying original stamps, buy only those that are authenticated. This will give you a baseline for your philatelic study, and the extra cost of authenticated stamps will pay for itself many times over. Else, look around for sizable lots of Helgoland stamps. Assuming that most of the stamps in these type of lots will probably be reprints, remember not to pay more than $1 or $2 per stamp as the total cost of the lot. Then, have an expert look at them and tell you which ones are originals and which one are private reprints. This is a good way to begin a small reference collection that you can use for verifying the authenticity of future acquisitions. I recently lucked out .... I bought a collection lot of 35 Helgoland stamps from a Germany eBay seller for €79.00 . I sent the lot to an expert and found that 19 of them were actually original stamps, including some very scarce issues and high-priced shade varieties. As far as the philately of Helgoland is concerned, the popular use of the German initials "ND" in the philatelic marketplace can be very misleading. "ND" is the abbreviation of the German word "Neudruck", which means "Reprint", or literally translated to English, "New print". 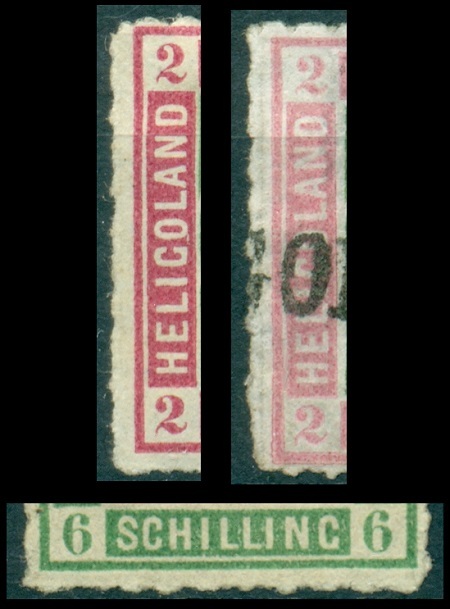 Many dealers, worldwide, use the "ND" symbol on their listings for the very common "private reprints" of Helgoland, which are worth about $2.00 each. This is NOT what the abbreviation means in the Michel catalog listings for Helgoland though. The ND notations in the Michel catalog are for the extremely rare Amtliche Neudrucke, or official reprints made in 1890. These are NOT the same as the Privat Neudrucke, or private reprints, made between 1875 and 1900, which represent the majority of Helgoland stamps available on the philatelic market today. Both types of reprints will be summarized in the following two sections. When Helgoland became part of the German Empire in 1890, the State Printing Office produced "official" reprints of the current 5 Pf., 10 Pf., 20 Pf., 25 Pf., 50 Pf., 1 Mk., and 5 Mk. Helgoland stamps, and they were turned over to the Philatelic Museum in Bonn, Germany. The "official" reprints, according to the Michel catalog, were printed on white, satin paper with yellowish gum, and they were perforated 13 1/2 x 14 1/4. A total of 200 stamps of each denomination were printed for the Postal Museum. A number of stamps of each of the denominations, except for the 5 Pf., were later discovered missing from the Postal Museum, presumably stolen, and a few of them reside in private collections today. It is uncertain how many of these stamps may have survived or if they may have been destroyed. Very few of them have been located. When one of these stamps DOES appear in international auctions today, the realization is usually exponentially more than the value quoted in the Michel catalog. As far as the average Helgoland collector is concerned, these official reprints are unattainable, and most collectors will never own one. Individually, as far as availability and rarity, the USA "Inverted Jenny" airmail stamp of 1918 is much more common and attainable. It is this category that has made the German States stamps of Helgoland one of the pariahs of philatelic specialization over the last century and a half. Just tell any stamp dealer you collect Helgoland and watch the expression of astonishment, then terror in his facial expressions! When my APEX friend first visited the German States stamps section of my website and contacted me, saying that he "specialized in Bergedorf, Lubeck, and Helgoland", my initial response was "You really DO like living dangerously!". The Helgoland "private" reprints were produced by Julius Goldner (1841-1898), a well known 19th Century Hamburg stamp dealer and wholesaler. His business practices would be outright criminal in today's world. But, in the early days of philately, making copies of old stamps and postal markings was more acceptable, at a time when clear ethical guidelines for philately had not yet been set. In a newspaper article written after his death, it was said that he was an esteemed businessman, with whom the firm of Stanley Gibbons had done business with for many years, as a provider of vast quantities of common postage stamps. Goldner is also known for producing "reprints" of Hamburg stamps, for producing forged postmarks on the stamps of Hamburg, and for his collaboration on the forgeries of the stamps of Transvaal and Romagna. With the implementation of the new German Mark in 1875, Julius Goldner persuaded the Postmaster of Helgoland to order reprints of the earlier Schilling issues. These so-called "Semi-Official Private Reprints" were printed at the Imperial Printing Office in Berlin, using the original plates. Many thousands of them were produced and sent to the Postmaster in Helgoland. The Postmaster turned them over to Goldner who placed them in souvenir shops on the island to be sold to tourists. In 1878 and 1879, Helgoland was plagued by floods, and the local government was severely in need of money for reconstruction and repair projects. Goldner, for his contribution, bought the original plates of the Schilling issues, the plates of some of the Pfennig issues that had been withdrawn from use, as well as all the unsold inventories of the Schilling stamps still on-hand at the Helgoland post office. Goldner continued to have reprints produced in Berlin, far beyond the original order for the Postmaster of Helgoland. A new British Governor General was appointed for Helgoland in 1886. When he found out what Goldner was doing, he demanded that the Imperial Printing Office stop producing the reprints. So, after a 10 year operation in Berlin, Goldner had to take his Helgoland plates and move! Next, Goldner moved to Leipzig. In Leipzig, he contracted with Giesecke & Devrient to produce more "Private Reprints" during 1888. Goldner then moved back to his hometown of Hamburg, where he contracted with F. Schlottke & Co. to produce yet more "Private Reprints". There were four different printings of these Hamburg Reprints between 1891 and 1895. Between 1867 and 1890, a total of about 2,690,000 "original" Helgoland postage stamps were produced. In Berlin, Leipzig, and Hamburg, between 1875 and 1895, Julius Goldner produced an estimated 7,000,000 reprints. Needless to say, the majority of early 20th Century stamp collections contained Helgoland reprints, NOT the originals. Even to this day, most of the Helgoland stamps on the philatelic market are Goldner's reprints! In the ensuing web page articles on the different German States stamp issues for Helgoland, the characteristics of the reprints, as well as the originals, will be illustrated and described in detail. Postal Stationery - Cut Squares ? Postal Stationery is a subject that I haven't delved into a lot on this site, but there is something that needs to be mentioned here. There are numerous so-called Helgoland cut-squares in the philatelic marketplace. A large number of these are reprints or forgeries. They were intentionally manufactured as cut-squares and were never part of full postal stationery envelopes or postal cards. They are generally characterized by poor printing, for example, with the hair knot not being seen, and the embossing is not sharp. In many instances, the borders have a cut appearance (too smooth or too parallel), rather than being machined by a card cutter. They also exist with forged cancels. The caveat? If you want to collect Helgoland postal stationery .... COLLECT ENTIRES, HOPEFULLY THAT HAVE BEEN AUTHENTICATED! The authoritative work on the stamps of Helgoland is the German lanuage book, "Helgoland Philatelie" by Hellmuth Lemberger, published in 1970. If copies can be located, they are usually very expensive. The APRL has a couple copies that can be checked-out by APS members.